More and more NJ residents are making the switch to clean energy–either through rooftop solar panels or by changing their power provider. This article takes a look at the state’s electricity generation portfolio and some of the reasons someone should consider switching to a clean energy provider in New Jersey. Where does New Jersey’s electricity come from? If you live in New Jersey you may (or may not have) wondered where your electricity is sourced from. The table to the right gives a snapshot of the state’s electricity generation in 2012 (data via EIA). As you can see, the vast majority comes from gas-fired power plants and nuclear plants. Just over half of New Jersey’s electricity is supplied by 3 nuclear plants. ‘Natural gas’ is the second largest player in the state, with coal and a smattering of non-hydro, ‘other’ renewables following this up. It is widely understood that using coal as a fuel source has serious health and environmental impacts–carbon dioxide emissions among the latter. 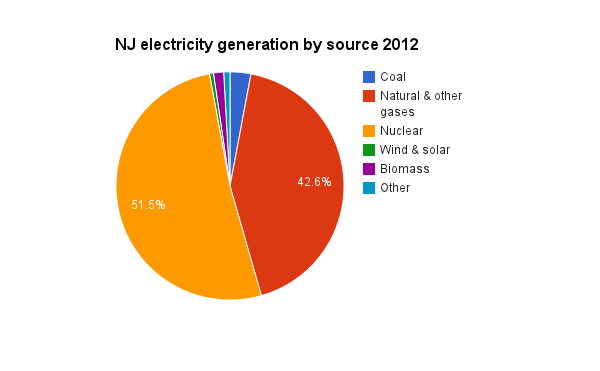 Fortunately, NJ does not rely heavily on power generation from coal. However, like many other states, electricity generation from natural gas, as part of the nation’s shale gas ‘boom’, has become much more prolific in recent years in New Jersey, thanks to advances in technology (most notably ‘fracking’) that allow extraction of previously inaccessible gas resources. Although shale gas has been promoted as a ‘low-carbon’ fuel source in comparison to coal, the fact is that it is still a significant emitter of greenhouse gases–both in generation and during extraction–not to mention the other health and environmental impacts that it is having across the country. As noted above, New Jersey also relies heavily on nuclear power plants for its electricity. The good thing about nuclear power is that it is basically free of CO2 emissions, and once plants are built, generating power is comparatively cheap. However, as many are aware, there are trade-offs when it comes to nuclear power–one of the major issues being that of the storage of spent nuclear fuel, for which workable solutions have thus far remained largely elusive. At the moment, both nuclear power and natural gas are obviously integral in securing electricity access for NJ residents. But New Jersey is aiming to move away from them, with an ambitious renewable energy target of of 20% by the year 2020, 3.5% of which is to come from solar power. In fact, after California, New Jersey is the number 2 state for solar power capacity in the country. It’s easy for New Jersey residents to make a difference in their state. You can accelerate NJ’s transition to clean energy in advance of what the renewable energy target mandates by signing up to have Community Energy be your electricity provider. Community Energy played a major role in developing New Jersey’s first wind farm–the Jersey-Atlantic Wind Farm off the coast. 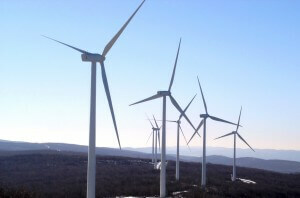 In addition to this, we have a number of other large wind and solar projects across the northeast, including the Bear Creek Wind Farm and Keystone Solar Project in Pennsylvania. All of these projects were made possible by ordinary people choosing to come on board with Community Energy. How much will clean energy add to my electricity bill? It is possible for NJ residents to make the switch to a cleaner energy supply for at little as $5/month through Community Energy. Signing up is quick and simple. Get in touch with us today to learn about how it works! Can I have solar panels installed on my roof in New Jersey? A mentioned above, New Jersey is a national leader when it comes to solar power, and there are some generous incentives in place for those who decide to install a system. Rooftop solar panels are an excellent option for homes and businesses that want to to reduce their carbon footprint, lock in electricity rates for 20+ years, and improve their energy independence. Whether your roof and circumstances are well-suited for solar power depends on a number of factors, so a consultation is necessary to determine eligibility. If you’re interested, get in touch with our solar team to learn more: 1.484.654.2470. Zero-down, ‘pay as you go’ solar leasing options are available in addition to purchase options.